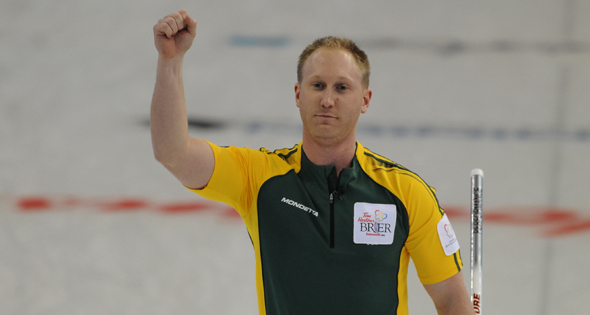 EDMONTON – Brad Jacobs of Northern Ontario stole two in the fifth and a single in the eighth to beat defending champion Glenn Howard of Ontario 9-7 and advance to tonight’s final of the Tim Hortons Brier, presented by Monsanto. Jacobs and his Sault Ste. 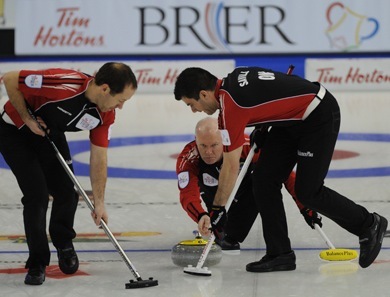 Marie team will try for their first Brier championship – and Northern Ontario’s first since 1985 — against Jeff Stoughton of Manitoba in the final at 6:30 p.m. MST (TSN-RDS). Howard plays Brad Gushue of Newfoundland-Labrador in the bronze medal game at 1:30 p.m. That game is available at www.tsn.ca. “I don’t even know what we just did,” Jacobs said after the stunning victory. “That’s the first time we’ve beat that team since they got (Wayne) Middaugh (two years ago) so it means a lot to us. They’ve beaten us a lot … to get one for our team is awesome. The teams traded deuces through the first four ends. Howard and Jacobs had easy draws for their twos in the first and fourth ends and Jacobs a routine hit-and-stick in the second. In the third Jacobs made back-to-back pinpoint draws to the button only to have the veteran Howard calmly execute an angle raise on his first stone and a double with his second to score a pair. “I can’t explain how vital that is,” Jacobs said of his team getting the early deuces. “They are so good, you think deuce, they’re going to force you (to singles), deuce, force you, but getting those back was really the key to that game. And the steal, we forced them into a real tough shot and we got a break. Jacobs, with third Ryan Fry, second E.J. Harnden, lead Ryan Harnden, alternate Matt Dumontelle and coach Tom Coulterman, stole a pair in the fifth to gain the upper hand. They got a break when Howard just rubbed one of their counters with his first stone and was wide with an attempted hit and roll with his second. “Bottom line is their skip out-curled our skip, that was the difference today,” said an obviously disappointed Howard. “I missed two bad shots in the fifth end and they stole two. That put then in the driver’s seat and we couldn’t come back. I threw a little too much weight on both shots and I missed them. 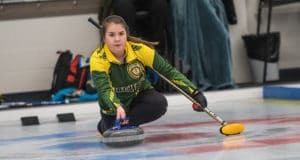 The steal put Northern Ontario up 6-4 and marked the third straight game that Howard, and his team of third Wayne Middaugh, second Brent Laing, lead Craig Savill, alternate Scott Howard and coach Scott Taylor had given up six points in a game. Through their first nine games – all wins – of the round robin they never gave up more than five. 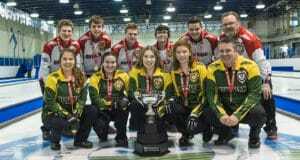 But they gave up six to lose to Kevin Martin of Alberta in the final round-robin game and seven to Manitoba in losing the Page one-two game. Howard had a chance for three in the sixth. He had shot rock in the four-foot and came through a port trying to kick out a Jacobs’s stone that was second counter, also in the four foot. He got the Northern Ontario stone out but both his shooter and a potential second Ontario counter both rolled too far, leaving Howard with just one. Even when Howard made pinpoint shots, like his hit and roll behind cover in the seventh, Northern Ontario had an answer. Jacobs executed another angle raise to take out Howard’s stone and count his fourth deuce for an 8-5 lead. Jacobs, 8-3 in round robin, stole a huge single in the eighth when Howard was light with his last-rock draw attempt. Howard got two back in the ninth but taking a two-point lead, with the hammer, going into the 10th, gave Jacobs the opportunity to hit out the string for the victory. 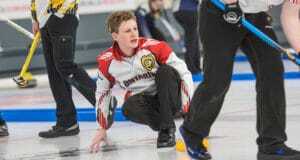 Northern Ontario had advanced to the semifinal with a 6-5 win over Newfoundland-Labrador in the Page three-four game. Ontario dropped into the early morning game by losing 7-6 to Manitoba in the one-two game.